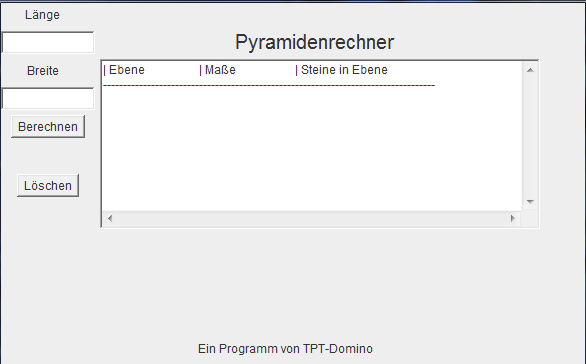 Unser eigener 3D Pyramidenrechner ist nun auf unserer Seite verfügbar. Dieser Rechner erlaubt es sowohl quadratische als auch rechteckige Pyramiden exakt zu planen. Wir wünschen damit viel Spaß und freuen uns bald spektakuläre 3D Pyramiden zu sehen. We are a group of volunteers and starting a brand new scheme in our community. Your web site provided us with valuable information to work on. You've performed a formidable process and our whole community will likely be grateful to you. After looking into a few of the articles on your web site, I honestly appreciate your way of blogging. I book-marked it to my bookmark webpage list and will be checking back soon. Take a look at my website too and let me know how you feel. I'm gone to convey my little brother, that he should also pay a visit this blog on regular basis to obtain updated from newest news update. Its not my first time to go to see this site, i am visiting this site dailly and obtain nice data from here everyday. Hello, everything is going perfectly here and ofcourse every one is sharing information, that's truly good, keep up writing.